The state of Florida is well known all over the world for its theme parks, but there's much more to Florida than the Walt Disney World Resort and Universal Studios Orlando. The Sunshine State is also home to many beautiful coastal cities that deserve to be explored. Fort Lauderdale is one perfect example. Located on the eastern coast of the Sunshine State, less than 30 miles away from Miami, Fort Lauderdale is the county seat of Broward County and is home to some stunning beaches, around one hundred different marinas, countless campgrounds, over 100 night clubs, more than a dozen museums, several excellent malls, and hundreds of amazing restaurants. Some of the top spots to check out in this Florida coastal city include the Bonnet House Museum and Gardens, Lauderdale Beach, the Hugh Taylor Birch State Park, the Museum of Discover and Science, the Historic Stranahan House Museum, Butterfly World, Las Olas Beach. If you're planning a trip to Fort Lauderdale, it's useful to know that this Florida city is also home to a long list of excellent, highly-rated hostels. 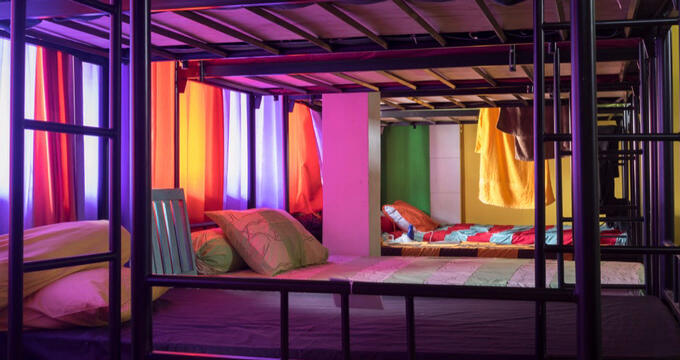 These hostels offer affordable accommodation in clean rooms and dorms, typically featuring shared bathrooms, communal kitchens, and other spaces for guests to interact with one another and live independently. Read on to learn all about some of the best Fort Lauderdale hostels. There aren't actually too many hostels right in the city limits of Fort Lauderdale, with many guests to this coastal city choosing to stay in neighboring areas and drive or travel into Fort Lauderdale each day, but if you do want to be right in the heart of this historic city, the Chocolate Hostel is a good option for you. This is actually one of the newest hostels in the Fort Lauderdale area and is an adults-only location with plenty to offer. It's located right by the Lauderdale Harbours and Rio Vista districts of the city, within walking distance of some interesting beaches and attractions like Fort Lauderdale Beach Park, Las Olas Beach, and the International Swimming Hall of Fame Museum. The Chocolate Hostel is family owned and operated Fort Lauderdale hostel that aims to provide a friendly community feel for all guests. In order to make everyone feel welcome and create a big family atmosphere, the staff here organize a lot of fun events and special activities like movie nights, BBQs, pot-lucks, live music concerts, and more. The staff will also be very happy to answer any questions you might have about the city of Fort Lauderdale and share their tips and experience to help you get the most of your time in the area. As well as nice staff, you'll find clean rooms, free Wi-Fi access, bike racks, a communal lounge, secure storage lockers, a swimming pool, laundry machines, and more at this Fort Lauderdale hostel. Despite having the word 'Hotel' in its name, the Hotel Deauville of Fort Lauderdale also has similar facilities to an inn or hostel, as well as functioning as a crewhouse for cruise ship crews in the area. There are several different kinds of accommodation to be found here including dorms, shared rooms, private rooms, and single rooms, but they're all decorated and maintained to an impressive standard, helping everyone feel right at home. One of the main advantages of this Fort Lauderdale hostel, in addition to its clean and spacious rooms, is its location. Situated right by Lauderdale Beach, this hostel lets you wake up in the mornings, get dressed, and walk right down to the water's edge. You won't need to drive anywhere or rely on public transport to get around if you choose to stop at this hostel, with its location being just right for beach activities. It's also nicely located for some interesting nearby museums and good quality eateries too, so you'll have everything you need within walking distance. The hostel doesn't provide free breakfast but does feature its own cafe, so you can purchase snacks and drinks whenever you need to. You'll also find bike racks, BBQ grills, cable TV channels in the common room, and effective air conditioning throughout the hostel building itself to keep the rooms nice and cool. Another excellent hostel location in the city of Fort Lauderdale is Crocodhouse. Situated on 5th Avenue in the South Middle River part of the city, Crocodhouse is only minutes away from Downtown Fort Lauderdale and all of the big attractions like the Museum of Discovery and Science and the International Swimming Hall of Fame Museum. You'll also find great beaches and recreation areas like Las Olas Beach and Hugh Taylor Birch State Park to be within walking distance of this Fort Lauderdale hostel, so it's in a super spot for people who just want to explore the city of Fort Lauderdale and experience all it has to offer. You'll find both dorms and private rooms at this particular hostel. The dorms feature clean metal bunk beds and simple furnishings, with the private rooms also decorated and furnished to a decent standard. The local neighborhood is quite peaceful too, so you'll be able to enjoy good nights of rest at this hostel without being disturbed or interrupted. You'll find free internet access at this hostel, so can check out your social media feeds and keep up to date with the latest happenings around the world. You'll also get free parking if you've been traveling in a car and can find a communal kitchen, an outdoor terrace with comfortable seating, round-the-clock security to provide peace of mind for all guests, and full tea and coffee-making facilities for guest use too.